So if you read this blog then you will know that I am in Leeds on a regular basis to a point where it is ridiculous but I know that some people still get lost within Leeds and I fully understand due to the grand train station for a start so I thought that it would be nice if I did a sort of guide to Leeds blog post just in case some of you want to look at it or need it at any point. So first of all, shopping. Leeds is the third largest city within the UK therefore shopping can be a busy affair especially if you have no clue where you're going. 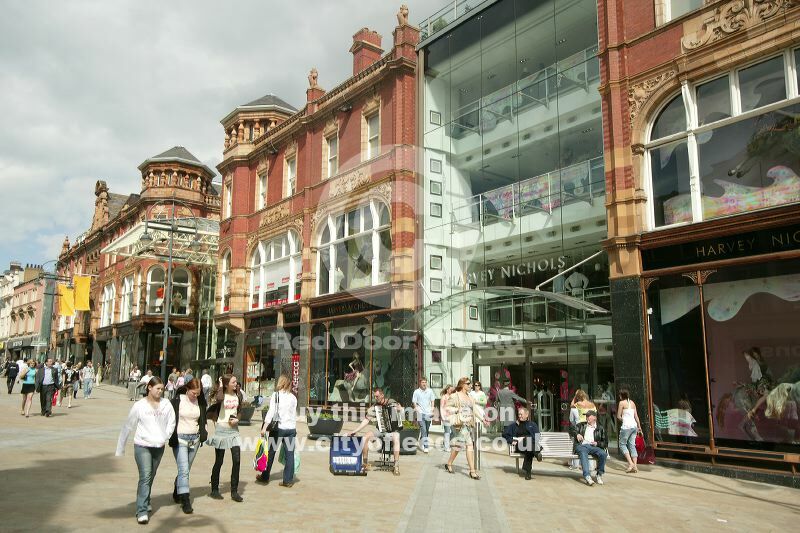 The first place to shop is Trinity Leeds which you can't miss even if it's your first time in Leeds. This shopping centre is a couple of minutes walk away from the train station and has a massive T on the side of it so even if you're coming from somewhere on the other side of the UK you'll instantly recognise it. 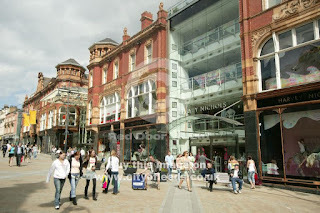 The centre contains many shops such as H&M, Burton, Moss Bros, Apple and many other places. You can spend a good few hours just window shopping here! The second place that I would recommend shopping wise is Victoria Quarter. I didn't know about here until this year to be absolutely honest. I had past it and been in it a couple of times to get out of Harvey Nicbols but otherwise I stayed away from it. With a glass doors and a feature fountain the middle of the building, VQ is an absolute masterpiece to shop in especially with shops such as Vivienne Westwood, Jo Malone London, L'Occitane, Reiss, Oliver Sweeney and much more. It is a high end sort of mall but its an absolute wonder to wander through and to have a look at some of the products within certain stores. If you're going for something to just eat then Trinity Kitchen with Trinity Leeds is an amazing place to go as there is so many different pop up vendors every month that you'll find something that you love instantly. Trinity Kitchen has a few stay there vendors which includes noodle based Pho and rib based Chicago Rib Shack. The street food vibe adds to the whole shopping centre to give it a fashionable yet amazing edge. If you're fancying more mainstream but still with a twist then Five Guys might be for you with their well known burgers, fries and shakes which is a few minutes walk from the train station. Five Guys also boasts a Coca Cola Freestyle service which has over 100 different drinks from what I remember and as it's unlimited you can have as much as you want and create whatever drink you want. If you're wanting somewhere more drinks and maybe a meal with some friends sort of places then I shall suggest some to you whicb may tickle your fancy. The first one is The Alchemist. 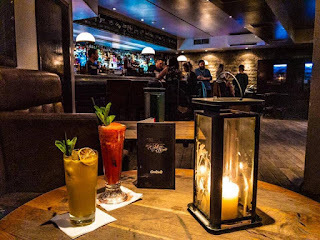 They are most well known for their scientific/alchemy based cocktails where they conjure up magical things such as a Mad Hatters Tea Party to share or a cocktail which changes colours or one that even changes flavours. They also do some amazing food to soak up all that alcohol too. The atmosphere of the restaurant is phenomenal and it just makes an amazing place for a night out with your friends especially as there is now one in Trinity Leeds and one coming on Greek Street. The next place that I would recommend is the Blackhouse which I have done a post about which I'll link at the bottom. The view from the restaurant is stunning. They are more known as a steakhouse which means that their Steak and Ribs are exceptional. They also do some amazing drinks if you want something to drink whilst chatting with your friends such as Spiced Passion Fruit Mojito. They are only a couple of minutes walk away from Trinity Leeds. The last place that I would suggest food and drink wise is Black Swan. They're based next to Corn Exchange and do some amazing food and cocktails. I've also done a blog post about them as well. Their burgers are fab and they have two floors so if you want to chat and drink then theres a floor for that and if you want food then theres a floor for that too. It's an amazing place to have a drink and maybe some food with friends and then move onto the other bars that are on the same street which include the wonder Jake's Bar, Oporto and The Maven and other great places. So I hope that you have enjoyed this little guide of Leeds. Have you been to any of the above? Would you add anything different? Let me know down below. I hope that you have enjoyed this and I hope to see you next time for another blog post. I was asked to mention the Leeds Guide that Daniel Footwear did as a gesture. No money or products were given in exchange for this. I just thought it would be a good thing to do. I'll leave Daniel Footwear's website down below as they do some amazing products and also have a student discount and are based in Leeds!